Spirit is the airline that everyone loves to hate. I have flown them a few times now and have not had any issues. (My recent review.) If you know what to expect as far as baggage and other fees go, then the experience should be ok. Unless there is a huge delay or cancellation of course. From time to time they hold fare sales on their website. Today there is a $50 off Spirit Airlines coupon which is quite good. 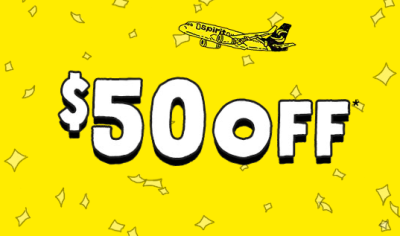 By using the code 50OFF you can get $25 off of a one-way ticket or $50 off of a roundtrip ticket. Of course certain exclusions apply. Check out this $50 Off* coupon! Book a flight only, flight + hotel, flight + car or flight + hotel + car for travel on Tuesdays, Wednesdays or Saturdays from October 22, 2014 through November 19, 2014 OR December 2, 2014 through December 17, 2014 OR January 6, 2015 through February 11, 2015 and you’ll get $50 off*! Simply enter 50OFF (all caps, no spaces) in the Promotion Code box on the home page when booking to get these savings! Book today. Exclusions apply. You can find the full terms along with the few excluded routes here. As you can see, the coupon works for travel on Tuesday, Wednesday or Saturday. The addition of Saturday makes it possible to plan a shorter trip which is nice. Of course, the main holiday travel seasons are blacked out, so this isn’t ideal for families. The greatest use of a coupon like this is on shorter routes. Since this coupon takes off a flat amount, your percentage saved is greater on cheaper flights. For example, lets take a look at an itinerary from Las Vegas to Oakland in early November. Since the coupon doesn’t take off the passenger facility or security fees, the maximum discount for this flights is $34. In the end, the total comes to $87, which is $58 less than the next cheapest option. Of course, if you factor in baggage fees then you may not be doing so well. This sort of sale really depends on the route and dates you choose. Sometimes the fare will be half of what competitors are offering. If you are traveling with a family, then the savings with deals like this really multiplies. If everyone is saving 50-75% off of a competitor’s price, then the savings adds up. Even if 1 or 2 people in the party need to check a bag, you can still really come out ahead in the end. This sort of deal is a good one if you have upcoming travel plans which may involve midweek flights. I highly suggest not ruling out Spirit merely based on their reputation. It doesn’t hurt to take a quick look at the deal to see if you can save some money.